Defunct Audio Manufacturers - O - audiotools.com. Company formed in 2002 and based in Romsey, in Hampshie, England. Made high end isolation platforms and turntable stands. Went out of business in 2006. British manufacturer of professional audio equipment originally founded in 1984 by Zdzislaw Jozef "Jo" Olenski and was based in Knutsford in Cheshire. Best known for their line of PA loudspeakers although as time went by the company added electronics to their lineup including pro-audio amplifiers. Ohm Industries went insolvent in 2003 but a year later Mr Olenski formed Idex Ltd. that took over the trademark and product lines of Ohm. USA based mail order retailer founded by brothers Irving, Sidney and Philip Olson in 1927 as Olson Radio and was based in Akron, Ohio. Interestingly the company had a chain of small retail stores spread across the USA, more like Radio Shack became later on, but their "catalogue" competitors like Lafayette usually had a few big stores in major metropolitan areas, also notable is that in the early years at the least a large part of their offerings was surplus stock and their catalogues where decidedly more downmarket than most, being printed on newspaper stock which in turn means that fewer copies have survived the ravages of time even though print runs hit the one million mark. In addition to developing their own lline of kits that were largely radio and audio related the company did sell audio and other electronic products under their own name including turntables and separates but their loudspeakers are the most fondly remembered by some although it is not known who was the OEM provider or providers for those, but in the 60’s Olson´s was still supplying USA made speaker components unlike most of cheaper electronics stuff that was by then largely imported from Japan. The company owned another firm originally called American Electronic Parts (AEPC) but later became known as Herald Electronics and was based in Chicago, Illinois, but HE became a sourcing operation for Olson´s in addition to supplying independent dealers with OEM products under a variety of names, that HE was a wholesale supplier meant that Olson´s ownership of the company was never much publicised. The budget nature of some of the company’s goods made for some interesting products, for instance Olson was the company that bought us the "Vibra Sonic" spring reverb, normal spring reverbs use a flat sprung feather attached to a couple of transducers, but to cut costs the Vibra Sonic actually used a bedspring, the sound did not resemble a real reverb in any way but it did make a wonderful “sploink” sound when hard pressed. Olson Electronics was taken over by Teledyne at some point in the latter half of the 60’s and that event marked the start of a decline in the company´s fortunes, Teledyne started dumping low cost but high mark-up wares into the stores and overall quality of the in house brands in general went down. In the late 70’s many of their smaller stores only stocked Olson branded products and locally sourced surplus stock, in addition the interest in surplus products declined with the miniaturisation of electronics and the growing purchasing power of consumer meant that kits were falling out of favour, the computer boom of the late 70’s and early 80’s seems to have been the final nail in the coffin since the people that had been electronic and ham radio enthusiasts a few years earlier were by that time spending their time and money on computers. The company appears to have gone out of business in the early/mid 1980's. Not to be confused with British concern Olson Electronics or a large number of small USA based companies that have appropriated the name since the demise of the original company. Norwegian manufacturer of high end amplifiers also known as Optimal Audio, stopped production in 1999 but IP and the rights to the name were bought by Musical Innovation and that company provides service and performs upgrades for the OAL line of products. A brand used by Sharp from 1977 to the latter half of the 80's in an attempt to break into the mid/high end market, but consumers had not responded well to the innovative computer controlled cassette decks of the late 70's that where the company's first forays into the high end market (at the least in the west). Despite having a full line-up of interesting and high quality products, including an intriguing servo turntable the venture was a failure especially since some products were labelled simply Optonica while other were branded with both names and the naming scheme was also not introduced concurrently in differing markets, creating some confusion amongst end users, the brand was revamped in the late 80's with a new logo and used more on cheaper AV systems but went out of use in the early 90's. Sharp has however re-entered the high end audio market with some success. Founded in Opelika, Alabama, USA by John Herbert Orr to manufacture magnetic tape for use with Reel to Reel recorders under the Irish brand. Mr. Orr who was known to his friends as Jack Orr, had been a Major in the American Signal Corps and was involved in their attempts to manufacture tape in Germany in 1945 for use by the occupying forces. Orr used the original tape formula from Karl Pfleumer rather than IP from BASF and thus the product was consumer grade tape of fairly indifferent quality. Bought by Ampex in 1959 and became their recording media division. Company based in Tokyo in Japan that manufactured a number of phonographic accessories. Best known for their headshells but 2 of their models in, the AV-101/101b and AV-1 that feature an adjustable azimuth are very well known and these days go for up to 10 times on the second hand market to what they originally cost, although it should be noted that Clearaudio make a model called Stability that is more rigid and at those silly prices a better buy. Company appears to have disappeared in the mid 80's. A brand used by UK based retailer Rumbelows for low budget brown goods, despite the oriental sounding name the only products seen under this brand were actually made for them in Western Europe, mostly West Germany. A short lived operation run by Michau Jay Yuen and founded in 1997 in Brooklyn, New York City, USA. Manufactured heavy duty isolation platforms that used air balloons as dampeners (or rather wheelbarrow type tubes), these were intended as bases for turntables or separates, and also fairly high end speaker stands called simply the "reference speaker stands"
Both the isolation platforms and the speaker stands were fabricated out of steel are rather massive affairs weight wise, the platform is around 15 kilos and the and each speaker stand just under 20 kg, in addition the stand is supposed to be filled with sand or lead shot. The platform is rather rare although it turns up on the second hand market from time to time but the stands were keenly priced, were heavily advertised at the time and appear to have sold rather well. 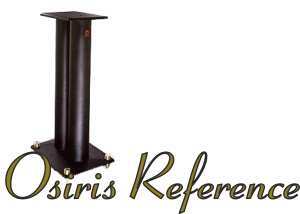 Mr Yuen founded another company called "Apollo Audio LLC" a year later that distributed KR Audio Electronics amplifiers alongside the Osiris product line. Although the stands in particular appear to have sold well they did apparently have razor thin margins and the company went out of business in the latter half of 1999 and was dissolved by 2001, the Apollo Audio operation ceased trading at the same time although it is technically still registered but we have not been able to find out if that company ever re-started trading or if Mr Yuen has been active in the audio business since. Spares & service :There are no spares left in stock anywhere, however as the products were primarily steel they are unlikely to break down, a competent machine shop can make a replacement brass spike for the stand if you bring them an original and the balloons in the isolation platform can be replaced by a DIY ones, just buy a similar size tube in a hardware store and you can but it up and glue it back together to fit, just remember to pump more air into it every now and then. Resources: Signature Sound in New York bought up all the remaining stocks of the stand shortly after the company went out of business, they still have a few tidbits on their site in regards to the product archived here including an old review from Soundstage Network and a few tips, Ssoundstage on the other hand has apparently deleted the original review from its site but does offer a "follow up" review by Dough Schneider..
Small company based in Fremont, Nebraska, USA, founded by Howard Pearson in 1961 and incorperated in 1963. 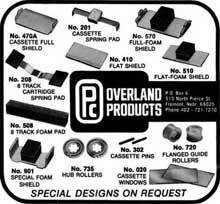 Originally manufactured small stamped metal products but soon therafter started to specialise in making tape pressure pads, but Mr Pearson had invented a way to make a reliable bond between the felt and the bronze of the pad. By 1970 the company manufactured all the pressed metal and plastic moulded parts needed for audio cassettes and 4/8 track cartridges, note that this is not the shells themselves but rather the bits that go inside them, as is shown here on the right in an old advert from 1972. The company remained in the media business until 2002 and with a fairly stable workforce of 8 people that managed to pump out a whopping 4 to 5 million pressure pads per day at it's busiest and was still making 1 and a half million a day when they quit the media business, but has since sold the felt pad operation to China and is now a service company with a workforce of 100 that manufactures pressed and stamped metal products. The company was sold to Lupus Capital at the end of 2011 and integrated into their Amesbury operation. A small turntable manufacturer based in Oxfordshire, UK and originally founded by Fraser Shaw and Jon Harker in the mid 80's. The company specialised in making high end heavy platter turntables that where quite different from the suspended designs that are the usual in the UK. The company was bought in early 1988 by Pascal Ravach who now runs Mutine/Audiomat, Mr. Ravach formed a new company around the operation called Oxford Acoustics Limited that was based in Abingdon in Oxfordshire, and ran it for a few years but it went out of business in 1993. While the company is no more, messers Shaw and Harker now run Oxford Audio Consultants and have been known to provide at the least minimal support for their products.